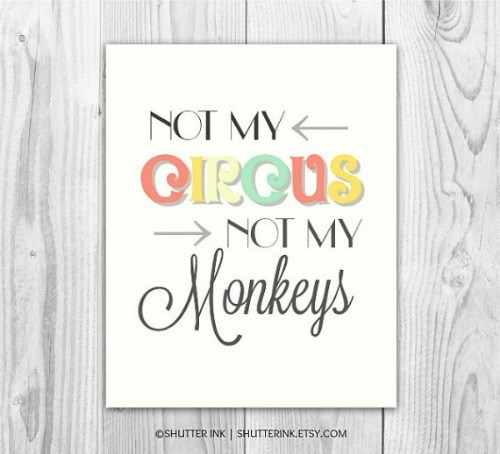 An old Polish proverb goes: Not my circus, not my monkeys! That’s now a chant I keep repeating to myself. Let me explain why. I’m by nature, what you might call a drama-magnet. No, that’s quite different from a drama queen, thank you very much! So what’s a drama-magnet? I have, until recently, constantly been drawn into other people’s drama – either as the chief ‘sort-outer’ of their lives, or as the focus of their drama. Someday, I could make quite a few bucks if I told the stories I heard and was drawn into. But my lips are sealed. I’ve realized the fact that people dumped on me, in one way or the other, was not their fault but mine. I have been giving off signals that I’m free to sort out problems and be dumped upon. Where did that come from? My own insecurities, no doubt. But I’ve learned the hard way, that you might stick your neck out for people, only to find that you are left being the ‘bad’ guy, while they come out smelling of roses! With 50 just a year away, I’ve acquired some wisdom at last. It also helps that I have a husband who keeps me sane! Now, if I find anyone trying to use me in this way, I politely tell them to sort out their own problems, while repeating to myself : not my circus, not my monkeys. This works like a charm. Have you tried it? Count me in this dose of wisdom too. I took long time to conclude this as well. And well this has helped me make that great leap of faith towards happiness. Trying to recall where I heard that phrase before. That’s a great motto to live by! Saves you from the unnecessary headaches and troubles! Absolutely right, Mrs Menon. Thanks for your comment. Have you ever gotten into the middle of a dispute, subsequently taken sides, only to find both parties reconciled, leaving you with one enemy, and a former liaison, who felt compelled to toss you under the proverbial bus, in order to pacify the other? Good motto to live by — I love this one! I can’t claim to live a ‘boring’ life FREE of drama, but I’m much more on an even keel than I used to be! I think we’ve both grown a lot in the time we’ve known each other!